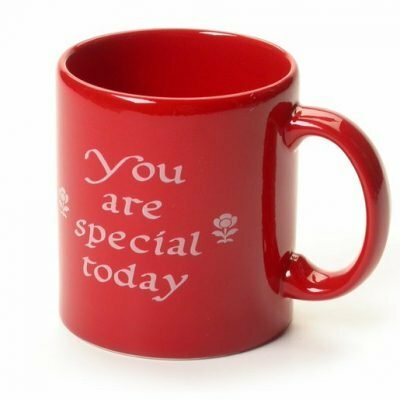 We have a new look but are the same trusted source for the “You Are Special Today” Red plate. 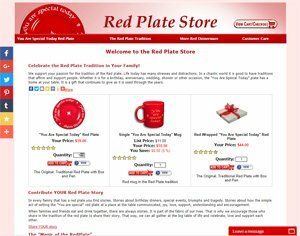 Celebrate the Red Plate Tradition in Your Family! We support your passion for the tradition of the Red plate. Life today has many stresses and distractions. In a chaotic world it is good to have traditions that affirm and support people. 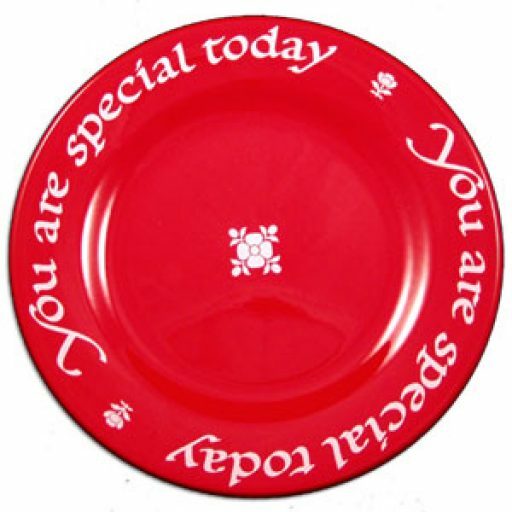 Whether it is for a birthday, anniversary, wedding, shower or other occasion, the “You Are Special Today” plate has a home at your table. It is a gift that continues to give as it is used through the years. The “Magic of the Red Plate” ~ It was a time honored tradition among early American families that when someone deserved special praise or attention they were served dinner on the red plate. Today, this custom, so dear to early American families, returns to remind us that a simple reward can mean so much. 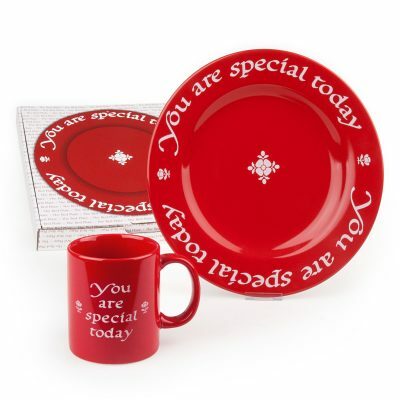 The Red Plate is the perfect way to acknowledge a family member’s special triumphs…celebrate a birthday…praise a job well done…reward a goal achieved…or simply say “You Are Special Today.” When the Red Plate is used, any meal becomes a celebration honoring that special person, event or deed. It is a visible reminder of love and esteem. This is a way of showing someone dear to you that they are appreciated and remembered. The Red Plate is designed and crafted to become a family heirloom as it is cherished and passed from one generation to the next marking life’s important milestones. The Red Plate…Make it a tradition in your family, symbolizing the good and happy times. It will speak volumes of love, when words just aren’t enough.